I have been painting cotton to sell at my booth in the market mall at the Quilt Canada (Calgary, AB). I use Seta Colour fabric paint. I have six of these wooden frame to stretch the fabric onto. 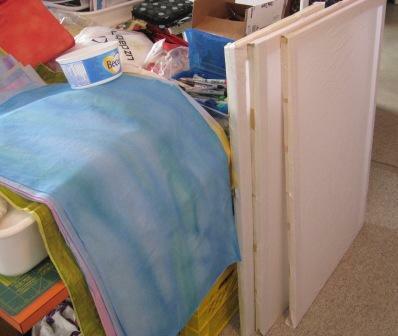 Most of the time I wet my fabric before I start painting. I also use a lot of water to dilute the paint. Some times I leave the frame flat to dry or I can tilt the frame and get the colours to run into each other a little more. 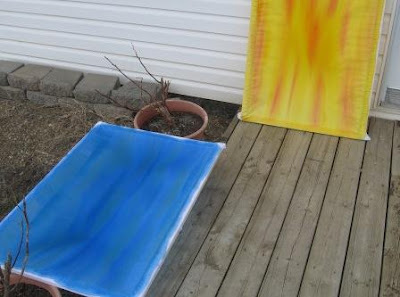 Here are two pieces outside drying in the sun and wind. Does anyone have other ideas for me? What would you buy? I love comments it makes my day.